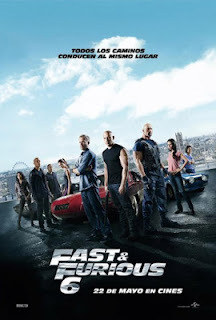 Reparto: Vin Diesel (Dominic Toretto ), Dwayne Johnson (Luke Hobbs), Paul Walker (Brian O'Conner), Michelle Rodriguez (Letty), Gina Carano (Agente DSS), Luke Evans (Owen Shaw), Jordana Brewster (Mia Toretto), Elsa Pataky (Elena Neves), Sung Kang (Han), Tyrese Gibson (Roman Pearce), Gal Gadot (Gisele Harabo), Ludacris (Tej Parker). Producción: Vin Diesel, Neal H. Moritz y Cayton Townsend. Montaje: Kelly Matsumoto y Christian Wagner. Productoras: Etalon film y Original Film.